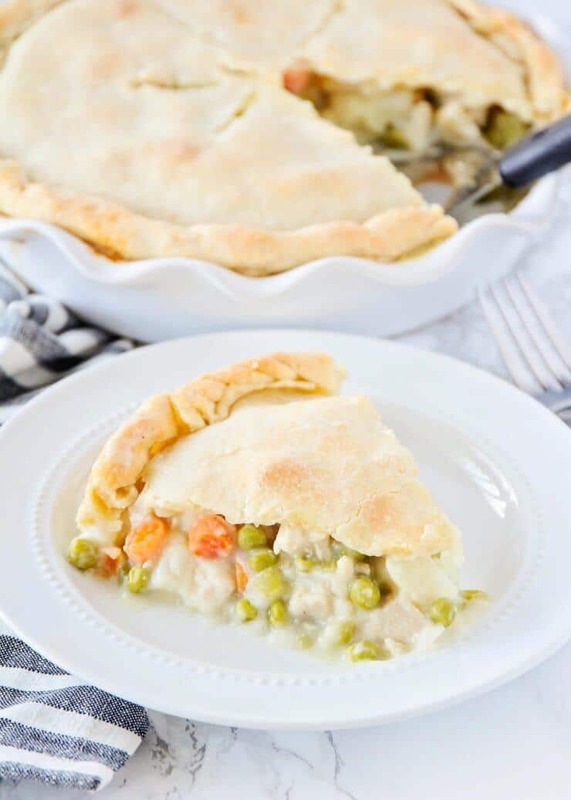 This chicken pot pie recipe is SO delicious! 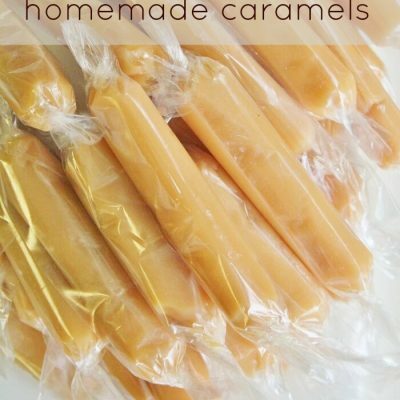 I don’t know about you but on rainy, gloomy days, I crave something warm and comforting. This homemade chicken pot pie does just the trick! The filling is savory and rich, while the light pie crust is flakey and cooked to perfection. Although homemade pot pie might not be as convenient as store-bought, believe me when I say it is so worth it! And once you get the hang of making this pot pie recipe, you’ll never turn back! 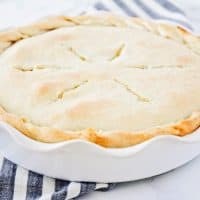 One great thing about homemade chicken pot pie is that you can easily tweak the recipe depending on what you have in your fridge! No chicken? Add leftover turkey. Out of carrots? Use corn or chopped green beans instead. 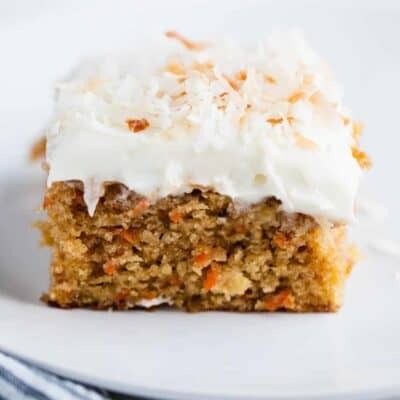 So many options to make this an easy, fridge-friendly recipe that your family or guests will love! 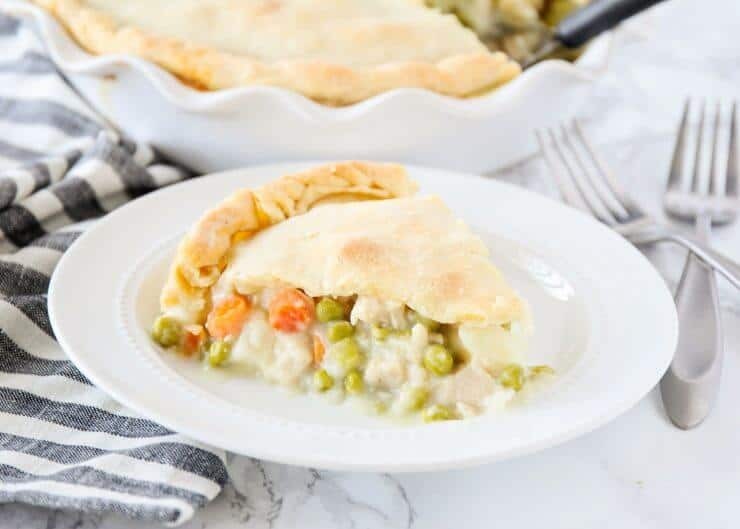 The homemade chicken pot pie recipe also saves very well , so you can easily double the batch and pop one of the pot pies in the freezer for later. So convenient and great to have on hand for a busy night! 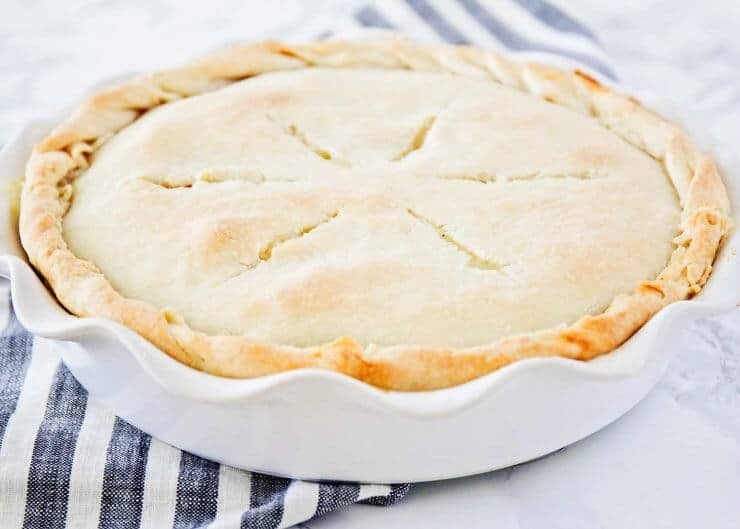 Follow the simple steps below to wow your family or guests with the perfect pot pie! 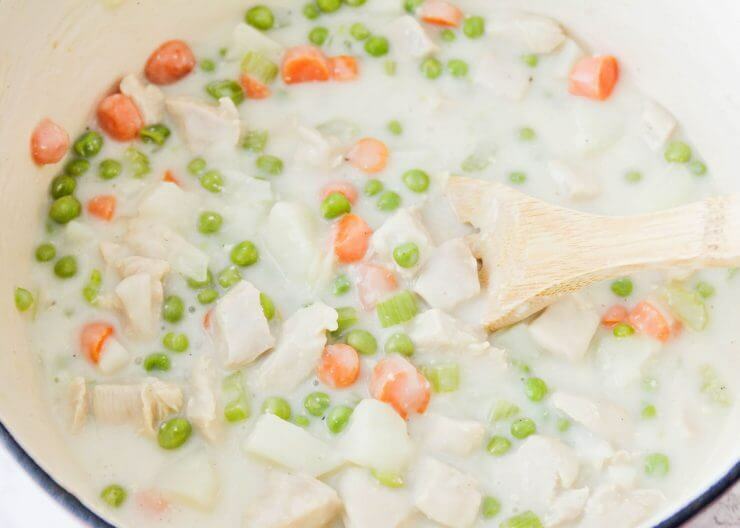 Preheat oven to 425 degrees F. In a pot, combine chicken, carrots, peas, potatoes and celery. Add chicken broth & boil for 15 minutes. Remove from heat, drain (reserving 1 and 3/4 cup chicken broth for filling) & set aside. Place bottom crust on pie pan & dab with a fork a few times. Place in oven & cook for 5-7 minutes. In large sauce pan, cook onions in butter (over medium heat) until soft & translucent. Stir in flour, salt, pepper, & celery seed. Next, slowly stir in chicken broth remains & milk and then simmer over medium-low heat until thick. Remove from heat & combine with the chicken, carrots, peas, and celery mixture. Remove pie crust from oven & bump oven down to 375. Place chicken filling in bottom crust. Cover with top crust, seal edges, & cut away excess dough. Make several small slits in the top to allow steam to escape. Bake for 25 to 30 minutes, or until golden brown (cool for 10 minutes before serving). This homemade chicken pot pie is to die for! A great household hit that'll have your family going back for seconds in no time. Nothing beats a warm, comforting slice of pot pie! In a large sauce pan, cook onions in butter (over medium heat) until soft and translucent. Stir in flour, salt, pepper, and celery seed. Next, slowly stir in chicken broth remains and milk. Simmer over medium-low heat until thick. Remove from heat and combine with the chicken, carrots, peas, and celery mixture. Remove pie crust from oven and bump oven down to 375. Place the chicken filling in bottom crust. Cover with top crust, seal edges, and cut away excess dough. Make several small slits in the top to allow steam to escape. 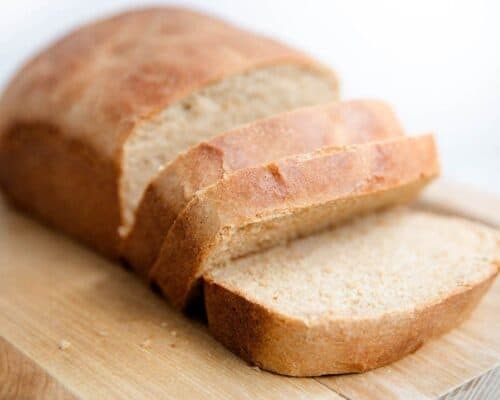 Bake for 25 to 30 minutes, or until golden brown. Cool for 10 minutes before serving. 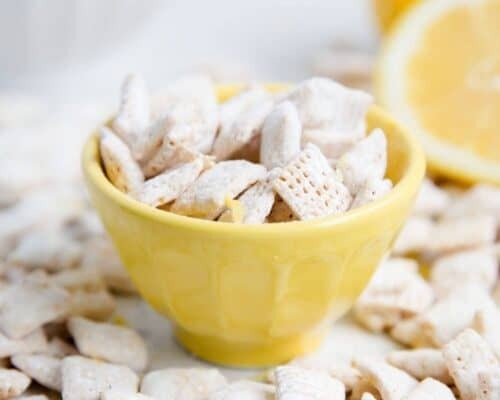 Want to make your own homemade pie crust? 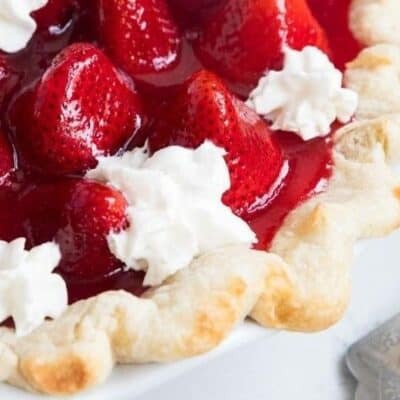 Click here for the perfect pie crust recipe! Hi, when you want to freeze it, do you cook it completely beforehand? I made mini pies with the leftover filling and used frozen shells, so I’m wondering if I should cook the whole thing or if it’s not necessary… Thanks!